I have been fishing the river exclusively since my last post and it has been scary good. Nearly every one of my spots has produced. What I have discovered though, is that if you give a man a fish he will eat for a day, but if you teach a man to fish he will steal your spot. So I will be light on the details when it comes to river fishing from here out. The highlight of the week was boating a very nice 16 inch redfish. If the little guy is any indication of how they fight, then I cannot wait to hook up with one of the big boys. My wife is out of town tonight, so I headed out early at 5 PM. I had planned on fishing the river, but as I got closer to the the bay, conditions seemed too good not to give it a go. So I was anchored at the "spot" by 5:45. Mild bill showed up a few minutes later an anchored inside towards fishing creek. The tide was going out, so I was positioned just north of the rip. My first 3 casts resulted in a 16, 18, and a nice sized blue. Not long after, I boated a very nice healthy looking 24. My next battle was with a fish that I knew was bigger than your average summer Striper. The splash was huge and he made several drag screaming runs before finally giving up after 5 minutes. This one required a net and I was pleased as hell, when the tape showed a New England Keeper sized 30. The bite at the point soon slowed, so at 6:30 I pulled anchor and headed back into the river. When I pulled into "the cove" there was bait everywhere with big fish clearly under them. My frustration level was running high with all the action around me while Popa Dogg went untouched. I changed tactics and casted back out towards the deeper water and the action began. Nearly every cast I had a huge blow up. The same fish would literally jump 2 feet in the air from the same spot each time. Finally after 4 or 5 tries, I had her on. I must say that a 25 inch fish in 2 feet of water is twice the excitement of a 30 in open water. I just love river fishing. 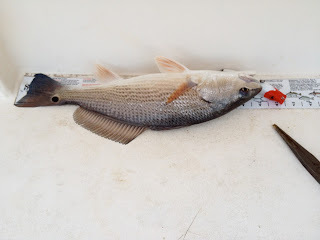 Hey Rick I was fishing on the other side of the Cove in my mako with the kids and also caught some nice size rockfish and also a few 14-16 inch blues. Would love to fish with you one day.